Who discovered M57? Messier or Darquier? All sources, including historical ones such as Flammarion, point to Darquier as being the first observer of the beautiful Lyra Nebula. Sometimes (especially on the Web) it is stated that Darquier preceded Messier by a few days. I, on the contrary, believe Messier was the first man to discover the Lyra Nebula. Documents b) and c) contain mostly the same information. 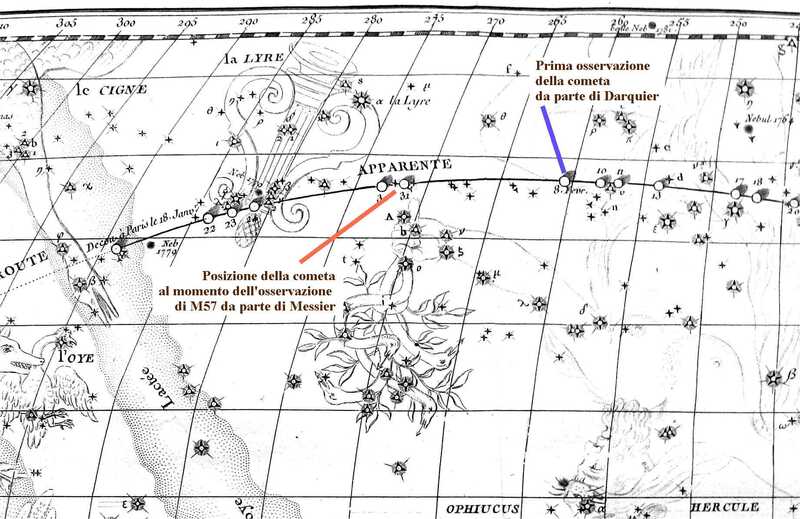 The attached map of the comet's path (an excerpt from Messier's Memoirs) is reproduced with kind permission from the Istituto Lombardo Accademia di Scienze e Arti of Milan. The comet was discovered by Bode in Berlin on January 6, 1779. Messier observed it for the first time, independently, on January 19, when its position was adjacent to the head of Cygnus (the Swan). (b Cyg – Albireo) . He continued his observations during the following days and on the morning of January 23 discovered the M56 globular cluster (between the Swan and Lyra). During the next days the comet approached the Lambda and Gamma of the Lyra. The weather was bad until the evening of the 30th, by which time the comet had already moved into the Hercules Constellation. Messier fonnd again it on the morning of January 31 and tracked its position using Beta Lyr, 7 degrees away from the comet, but the only star to be found almost on the same parallel. He then observed M57 which he described as "a small cluster of light which seems to be made up of very small stars” (!!). He partially corrected himself on September 3, stating " I was not able to tell if it is made up of small stars". Messier, in his memoir mentioned under b), refers that in September 1779 Darquier sent him a report asking him to read it to the Academy and to publish it. I summarize it below. Darquier says he heard about the comet on February 9 from the Gazette de France - containing Messier's announcement (page 197 of document c). He also adds that the weather was cloudy from January 26 to February 10, except for February 6. .
As stated on page 201, he observed the comet the following night when its position was by then nearing u Her (star 223 in his catalogue - page 216). He tracked the comet's position from the star and found the distance between star and comet to be 37' right ascension and 14' declination. Note that the star is 27° away from Beta Lirae. He then continued his observations until March 25. He tracked the stars used to determine the comet's position on numerous occasions. Many were not included in Famsteed's catalogue, which in any case contained wrong coordinates. He repeated his observations twice, once in July 1779, and stated that in the course of his work he noticed numerous "nebuleuses", most of which were unknown. Unfortunately he did not list them and only mentioned M57, without specifying the date of observation. Also, no dates are mentioned in his detailed daily observations reported in the document under point c). 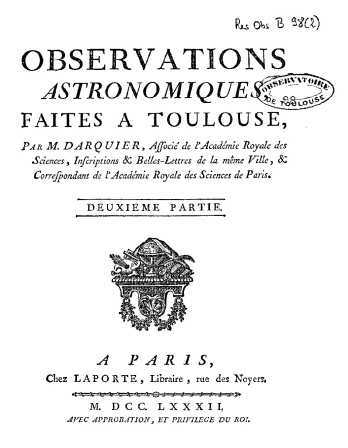 Please note that in his Memoir (printed in 1782, by which time Messier had already published the previous two catalogues) Darquier did not claim to have discovered the nebula first.
" but the one (nebula) I was happiest to observe is a nebula situated between two beautiful third size stars; it is very faint but perfectly defined. It is as large as Jupiter and looks like a planet whose light is burning out. Its precise position will be found in my catalogue. In the light of this evidence I feel it is only natural to claim that Messier discovered M57. It appears clear that Darquier did not observe M57 while he was following the path of the comet. There seems to be little foundation for the statement in several web pages that Darquier preceded Messier by "a few days" (January 1779) considering the observations in document c). 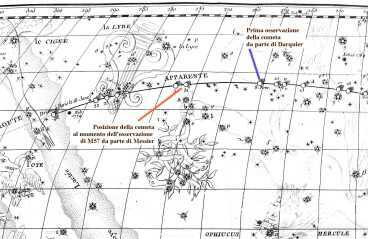 Between December 22 and January 26 Darquier's attention was concentrated on the Sun, Moon, Venus, Orion, Canis Maior and other more southerly consellations. It therefore seems unlikely that he "looked" towards Lyra and observed M57. Crucial evidence could be found in Darquier's observation notebooks. I don't know if these still exist and where they may be found.. If anyone has concrete and first hand information on this subject, please contact me via e-mail (caglieris_gm@infinito.it). How come the discovery was assigned to Darquier? I believe Messier himself is the involuntary cause. In the 1781 catalogue (third catalogue) Messier speaks about his and Darquier's "discovery" “() without mentioning dates and without specifying which of the two was the primary discoverer. I hope my work will help to completely clarify the matter and explain the merits of the two astronomers.